With your company up and running, have you planned to expand your idea and raise funds for your business? For this, you would need a cap table, which would help you keep track of and manage all the equity of your company. This is where Eqvista comes into the picture. With the help of Eqvista, you would be able to manage the cap table and also your company valuation in a much easier way. Before we talk about how Eqvista is right for you, let us have a brief introduction on what a cap table is, so you know what is coming your way. The simplest cap table is a list of the securities of a company like the stocks, warrants, options, and other securities, along with who owns them. In short, the cap table needs to be able to tell you who owns what and how much they own. But there are more complex cap tables for companies that are expanding or growing. In these complex cap tables, they also hold the formulas and models of the many different scenarios of company financing.These transactions include the sales of the company (M&A), new financing rounds, or public offerings. There isn’t only one way to do a cap table, but as your company grows, an Excel spreadsheet wouldn’t be able to hold all the details that you need. Using specialized software is much better so that you do not get the details wrong. Also, if your cap table is not up to date or disorganized due to the complexity in it, you can end up making the wrong decision which might cost your company too. For instance, in case you are looking for more capital for your company, you would have to check how many shares there are in your company that can be used without affecting your ownership in the company. Here, the cap table would help. If the details are not accurate, you can end up giving too much of your ownership to outside investors. With the cap table, you can quickly check to determine if you have the shares available to give out. You would then be able to make the right decision and even negotiate if things are not quite right. In short, a well-organized and accurate cap table using software would help you and empower you to make the best decisions as well as to stay in compliance with the law. And for this, you need great software like Eqvista to help you out. Being a sophisticated equity management software, Eqvista permits the company founders, shareholders, and investors to keep track and make the right decisions about the equity of the company easily. All companies from pre-IPO companies to seed-stage companies can manage their equity electronically. The system that Eqvista uses would help you manage the shares, your cap table and even the company filings easily, which you otherwise might have had a tough time doing so with your current system. The aim of Eqvista is to assist companies, even from the beginning of incorporation. In short, you can have your company incorporated and easily handle all your shares by staying compliant with the government all from one place – Eqvista. The highly professional and dedicated team at Eqvista would assist you with the work like cap table management, issuing of electronic shares for your company, and many other related tedious filings. So, you would not have to look elsewhere for any help related to your company. This platform was created to change the way every filing of the company is usually done. Where things may takes days to be done, it would be done quickly with Eqvista. In short, Eqvista’s objective is to simplify things for many companies along with simplifying the present difficult infrastructure. Create and manage all the equity transactions of your company with Eqvista. You would also be able to manage the cap table easily with proper analysis and real time updates. Moreover, you would not have to worry about incorrect cap table as all the transactions are tracked and recorded. You would be able to see all the advantages that this free software has to offer. You would no longer have to spend time on paperwork with Eqvista. In short, you can easily issue your shares electronically. With everything automated, you would be able to manage everything from just one platform. In short, you would be able to save both time and money. PLUS, the platform is FREE to use! You do not have to get your company valuated from expensive outside companies, when Eqvista’s professionals can help you with it at a much lower rate. At every step, the team would ensure that your company valuation is audit defensible and compliant. All this would be possible if you have your cap table recorded with Eqvista, which would make the valuation process seamless. 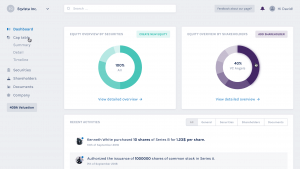 On Eqvista, you would be able to share all your company’s data with shareholders, accountants, lawyers, investors, other founders, and anyone else who you want to. With the help of the Distributed ledger technology (DLT), you would be able to keep track of all the unmodifiable activities. Also, you would be able to securely share limited or full access of data to view on the platform or to download. For even the busiest of founders, Eqvista is very convenient and easy to use as compared to many other softwares available. So, you would no longer need to spend hours or even days thinking about how to set the cap table. You would be able to use all the important tools needed in Eqvista. GET STARTED – IT’S FREE ! Manage Your Company Shares In One Place: Manage the shares of your company with the help of Eqvista platform and the professional team. Issue shares, transfer shares, and do a lot more in just one place. Set Up & Register Your Company: Have your company incorporated and set it up within minutes with the help of Eqvista’s team. Manage Your Complex Cap Table: As your company grows, you would find it easy to manage your cap table with Eqvista. Moreover, stay up to date with all the company filings and records as well. Get The 409A Valuation: With the professionals in the Eqvista team, you can easily have your company valuation performed to give your company the safe-harbor status. Keep a Check on Your Company Standing: With the company records and the details you put into our system, you can generate a financial analysis to see where you company stands. Connect & Share Information with Others: You can easily share full or limited access of the company information or the cap table with investors, lawyers, shareholders, accountants and many others. Moreover, you can easily grant the access to download reports as well from the platform. Become a Successful Entrepreneur: With the aim to transform how modern companies are developed and operated, Eqvista would always improve and gain new features as time passes to help you become a much better entrepreneur. Get & Use it FREE OF CHARGE: Yes, that’s right. There are no hidden charges, and you can use the platform for free. Eqvista feels that companies should be able to easily keep their share management well-organized and up to date. This is what would help the ideas of the businesses grow. In case you are confused on how to deal with the shares of your company and stay compliant with the law, then you are in the right place. Eqvista would take care of everything from your company’s formation to the management of shares. Being a group of accountants, lawyers, valuation professionals and entrepreneurs, Eqvista was created to help businesses run smoothly. Also, if you are not yet sure about some cap table or share related things, you can always check out the guides and blogs to understand these better. Eqvista has put up the guides to help you understand those things that other websites don’t explain clearly. If you have any questions about this, you can always connect and ask the Eqvista team. In short, have your company incorporated, issue electronic shares, manage the equity, stay compliant, and grow your business all on one platform – Eqvista! Join today to enjoy the benefits that the Eqvista system has to offer!